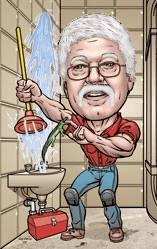 2015 Editions of the IAPMO/UPC &amp; ICC/IPC Plumbing Codes - Jay R. Smith MFG Co. The 2015 editions of the IAPMO-UPC and ICC-IPC plumbing codes have been released. The UPC remains the same in the storm drainage section as the 2012 edition. The IPC has changed some of their sizing criteria and deleted the roof square footage sizing charts which may create confusion. For those of you who fall under the UPC jurisdiction it is status quo for now. For those of you under the IPC jurisdiction, we will attempt to clarify some statements just in the event an engineer questions this revision. Presently, the AMSE A112.6.4 Roof Drain Standard is being revised by the ASME roof drain committee. The requirement for gallons per minute (GPM) flow through the roof drain will be addressed and a requirement for minimum flows will most likely be inserted at the next release of the standard. test piping configurations and dimensions. Actual installed flow rates cannot be stated unless the piping configuration is known and the effects of the drainage piping calculated. Both major codes (UPC & IPC) debated over proposals, verbiage and so forth in an effort to understand and clarify the confusion. Some are of the opinion the flow rate through the roof drain dictates the flow for the entire interior storm water system. This is not accurate as the piping configuration is the major impact on flow. Fact: The storm piping system dictates the flow not the roof drain. The configuration of the storm piping system will alter the GPM flow. For example per Table 1106.2 (Page 3): A 4" vertical drain will flow 180 GPM but when turned horizontally, it is reduced to 81 GPM @ 1/16" slope per foot and 115 GPM @ 1/8”slope per foot. The horizontal pipe size will have to be increased to 6” for both the 1/16” and 1/8" slopes to compensate for the flow. Refer to page 3. Shown on this page are three paragraphs (1105.2, 1106.2 & 1106.3) and two tables (Table 1106.2 & Table 1106.3) taken directly from the 2015 IPC Storm Drainage Section - Chapter 11. 1105.2 states the published flow rate and head of water above the roof drain shall be used to size the storm drainage system in accordance with Section 1106. However, 1106.2 states the vertical and horizontal storm drain piping shall be sized based on the flow rate through the roof drain but then states the flow rate in the storm drain piping shall not exceed that specified in Table 1106.2. Confused, it is understandable! Therefore, 1106.2 lists maximum vertical and horizontal flow rates. The horizontal flow rates are based on the slope of the piping and overrides and limits the roof drain and vertical flow rates. What does the engineer do since there are no published flow rates? He has two choices: use the square footage charts (Note 2) from the 2012 IPC or size his system based on the maximum flow rates shown in the Tables. As an example of the Tables determining the maximum flow, refer to page 4. The GPM flow rates at different heads are shown for a 4 outlet/vertical. Only the 4" outlet / 4" head falls under the allowable GPM flow rates. The others exceed the maximum flow rate shown in the table. ◊ There are no manufacturer’s published flow rates. ◊ The maximum flow rates in Table 1106.2 overrides any future published roof drain flow rates. ◊ Horizontal flow rates overrides vertical flow rates. ◊ Using the traditional roof square footage charts, the designer knew how much roof area to discharge to one drain. Note 1: The test data was based on flow through a roof drain with no piping connected and another test with a pipe connected and immediately turning 90° horizontally, running a short distance and turning 90° vertically. This test data does not establish precise/exact flows. This does not reflect real world conditions. Note 2: The square footage chart previously existing in both codes have proven to be adequate in sizing roof drains and interior storm water systems for over 70 years. These charts have safety factors built into them. Statements were made indicating numerous roof failures have occurred because of the inadequacy of the roof drain to flow the proper GPM or the inability of the designer to correctly size the storm water system because of a lack of flow rates not shown in the manufacturer’s catalog/web data. This is an alarmist statement with no basis of validation. There has never been a list released to the public unequivocally identifying the roof drain itself as the culprit in the so-called ‘numerous roof failures’. The majority of failures were a result of inadequate roof structure (most prevalence), lack of maintenance in cleaning the debris around the domes, undetected stoppage in the rain leader, lack of sufficient roof drains, undersized roof drains and storm water piping, improperly installed roof drains (page 5), lack of sufficient secondary/emergency roof drains/systems and lack of scupper drains in the parapets. The most common reason is an abnormal or catastrophic weather occurrence/phenomenon such as a hurricane, tornado, 500 year storm or micro burst.